Soldiers from the 642nd Regional Support Group prepare to clear a building during an urban operations familiarization event Aug. 22, 2017, at Ft. McClellan, Ala. Soldier lethality is one of the six priorities established by the Army Chief of Staff that will be the focus of six new cross-functional teams focused on modernization and readiness. 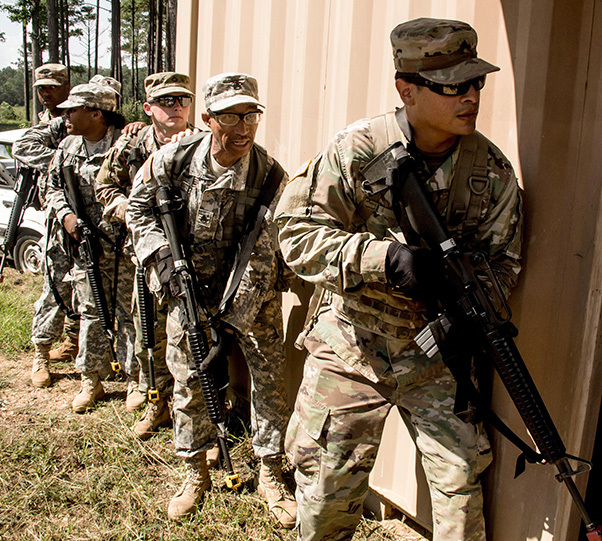 Vast readiness improvements are a challenge worth taking because if they succeed, Soldiers on the ground will reap the benefits, said acting Secretary of the Army Ryan McCarthy. That challenge is asking brigade commanders — all seasoned combat leaders eager for command of divisions and corps — to defer that dream and instead lead a cross-functional team that will focus on the Army’s modernization efforts. McCarthy, who spoke at an Association of the United States Army breakfast, Nov. 8, said he’s optimistic because he and the vice chief of staff of the Army recently met with prospective leaders for those teams, and he saw within them “energy and excitement” about the new mission. Those team leaders, “the best and brightest the Army has,” McCarthy said, will be rated directly by the vice chief of staff. McCarthy, as undersecretary of the Army, will oversee the entire effort, including development of a new Army command that is focused on modernization, and which is expected to stand up by next summer. McCarthy said most brigade commanders are likely not experienced at acquisition, requirements and other aspects of modernization. But what they do know, he said, is what it takes to win the nation’s wars. 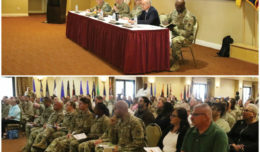 He called this approach a “vertical integration” of effort consisting of subject matter experts from across the Army, as well as some from industry and academia. “The end state is an empowered team, rapidly integrating and synchronizing … to deliver new capabilities to the operating force” that are aligned to the chief’s six priorities, McCarthy said. 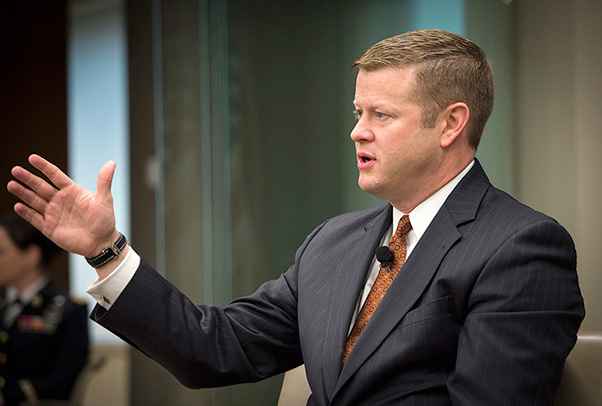 Acting Secretary of the Army Ryan McCarthy speaks about the Army’s readiness and modernization priorities at an Association of the U.S. Army breakfast, Nov. 8. Additional authorities may also be required to restructure the Army’s modernization effort — the biggest such restructuring in half a century, he said. McCarthy said he’s already been studying the National Security Strategy to ensure modernization command efforts dovetail with it, and he plans to present his recommendations to the National Security Council, via DOD. The secretary said an end to continuing resolutions and passage of a budget with “some teeth” would go a long way towards furthering Army modernization efforts. McCarthy also said that one of the important places Soldiers are now stationed is South Korea. While he didn’t go into the classified details, he did say that AMC has been involved in getting those Soldiers properly equipped, and FORSCOM has been involved in establishing the manning and readiness levels needed in the event of a contingency operation there. 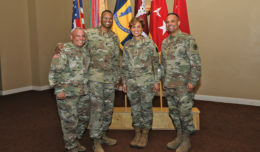 The Army’s chief of staff has also been closely following events there and is deeply involved in the process, he said. 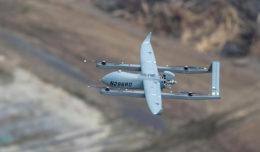 Lastly, McCarthy said vast improvements have been made in furthering the “One Army” concept, meant to improve communications and the working relationship between the Regular Army, the Army National Guard, and the Army Reserve. In 2009 and 2010 that wasn’t the case, with poor communications between the three components. Now, McCarthy said, there’s open communication, and Soldiers in all components are treated with respect and as equals.